José López’s bags full of cash, bulldozers looking for buried cash, Oscar Centeno’s notebooks talking about bags full of cash and now the raid on the former president’s houses indicate that the manipulation of cash is a central protagonist in corruption. They show that the great challenge that must be overcome by those involved with illegal cash is not so much how to get it but the logistics to receive it, transport it and hide it. The magnitude and complexity of the logistical problems posed by manipulating cash depends on the currency used. A paradigmatic example is the bags of José López. According to press reports, the former Kirchnerista official intended to throw approximately 9 million dollars into a convent. Since the highest denomination dollar bill is 100 units, Lopez had to use 6 bags to transport 900 stacks of $ 100 bills. Ifeuroshad been used, he would have had to handle 155 bundles of bills, which means that just one bagwould have been enough. If he had used Swiss francs, he would have had to handle 90 bundles, which meant that with a half bag or a much smaller purse he would have had enough. If he had used Singapore dollars, he would have had to manipulate only 12 bundlesof banknotes so with a schoolbag he would have had enough space. These data show that the complexity of the transport and concealment of the cash depends on the currency used. The highest denomination ticket in euros is 500, in Swiss francs of 1.000 and in Singapore dollars of 10.000. If any of these coins had been used, many acts of corruption would not have been discovered. The bags, notebooks and vaults would not have been necessary or would have had a much smaller role. Fortunately these coins are easier to hide but more difficult to use because they have less liquidity than the US dollar. This is surely what induced the suspects of holding illegal cash to opt for US dollars. 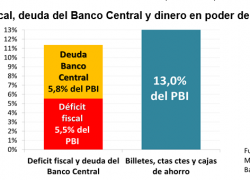 A “banking shock” can be the triggering factor in the transformations towards decency in Argentina. The fact that corruption and, in general, a large part of the economic illicit act through cash demonstrate this. 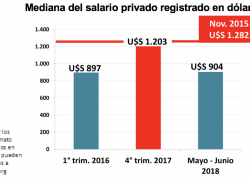 Although it is impossible to completely eliminate the risks of corruption, if the use of electronic money would have had similar penetration in Argentina than it has in advanced countries, it would have been much more difficult for companies to pay bribes in cash. Obviously there are other mechanisms to channel corruption, but they are much more sophisticated and generally more exposed and vulnerable to detection, especially in the current context in which the fight against terrorism and drug trafficking is a global priority. Thus, the massive use of electronic money would help to make the financing of politics more transparent, making a vital contribution to the quality of democracy and the republic. 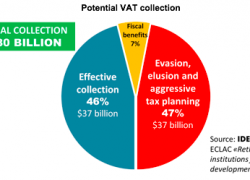 No less important is that it is one of the most powerful tools available in organized countries for the fight against tax evasion. 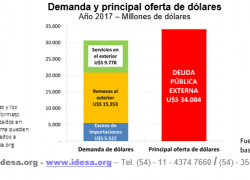 It must be borne in mind that only by approaching the levels of evasion prevailing in Chile the objective of eliminating the fiscal deficit and all the distorting taxes that challenge Argentina could be met. That is to say, using as a platform a massive bancarization, crucial goals that are part of the debate to overcome the crisis and initiate a sustained process of growth with equity could be achieved easily. For this, it is key that the national Treasury, the AFIP and the sub-national tax agencies stop penalizing the use of electronic money. Here, the check tax (a direct tax on the use of electronic money) and the tax-holds on gross income by provincial and municipal states must be eliminated. On the other hand, it must be found ways to impose costs, obstacles and even some prohibitions on cash payments.